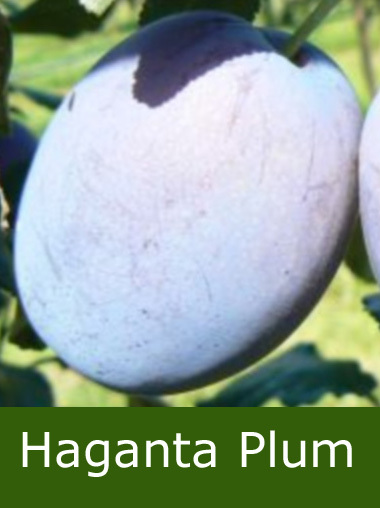 The Haganta offers large blue eating plums and has excellent resistance to disease (particularly Sharka disease). Very strongly scented and the fruits will keep well. This variety has a freestone which means it comes away from the plum flesh easily. This is from Germany so you can be sure that this plum is very well engineered and still saving from bailing out Greece. Fertility: This plum is C3 Partially self-fertile so you will get plums from this tree however your harvest will be improved by having another plum tree nearby in pollination group C2, C3 or C4. This variety of plum tree is supplied in a container, which means that the tree can be planted any time of the year and with better results than either bare-root or rootballed trees. Please choose which root stock you require from the drop down list below. Final heights can also be controlled by container size or pruning. The root stock options listed for your plum tree are made up from the options listed below. These generally tell you the shape and size of your mature plum tree. St Julien A: Roughly 45cm of clear stem and pruned to be more of a bush shape. Likely to flower more in the Spring. Expected final height of 3.6m. Pixy: Pruned to be more of a bush shape. Expected final height of 3.0m. Considered semi-dwarf. St Julien A (Half Standard): 1m of clear trunk and pruned to be a traditional tree shape. Ideal for gardens as this allows you to easily cut the grass and companion plant underneath if desired. Expected final height of 3.6m. Considered semi-vigorous. Bush: Side branches start much lower down the trunk giving more of a bush shape. V.VA1: Comparable to Pixy in terms of height and used by commercial growers. Final height around 2.5m. Ideal for small gardens. 7 Litre pots: A cheaper option but could be slightly thinner trunk and a little less developed due to roots being restricted. Generally 2 years old or more. 12 Litre pots: 2 years old or more. Bare Root: Delivery from November to March only. Comes with roots exposed, no compost or pot. Much cheaper, must be planted before March and roots not allowed to dry out. Maiden: 1 year old, little side branches, used as "blank slate" for training e.g. Espallier, Fan etc. Plum fruit trees may not winter well if left in their containers and may die so you need to plant as soon as you get them especially if purchased between October and March. Keeping them protected in a heated conservatory or green house should solve this issue if you are not going to plant them. Technically speaking it is possible to use Mirabelle plum trees to pollinate standard plum trees but has more risk than using a standard plum tree. If your plum tree is self-fertile, this of course is not an issue.